Trump on Charlottesville - stated the ‘obvious’ or is he ‘emotionally with KKK’? 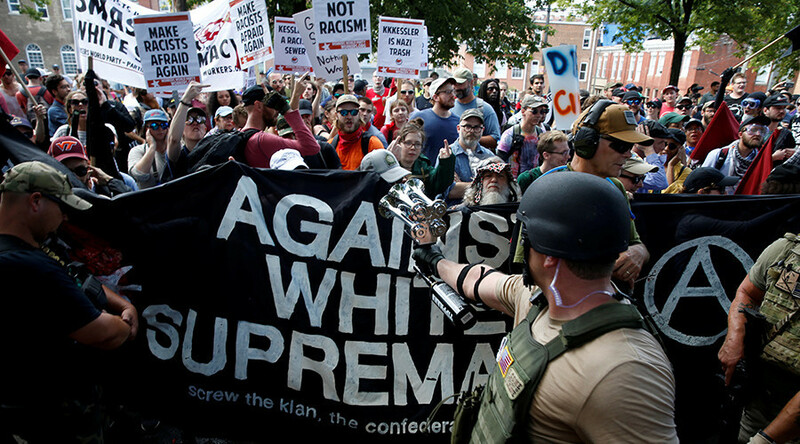 US President Donald Trump has denounced the violence that erupted on Saturday in the city of Charlottesville, Virginia, saying both the far right and the left are to blame for the bloody clashes. He was initially criticized for not explicitly condemning white supremacists rallying in Charlottesville. 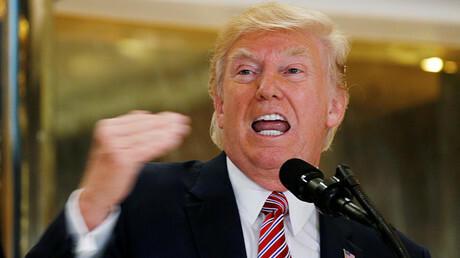 Trump also questioned the mounting campaign against Confederate monuments, saying that it could lead the US down a slippery slope and warned statues of Thomas Jefferson and George Washington could be the next to fall if the trend continues. US mainstream media have been quick to paint Trump as a sympathizer of neo-Nazis and white supremacists. 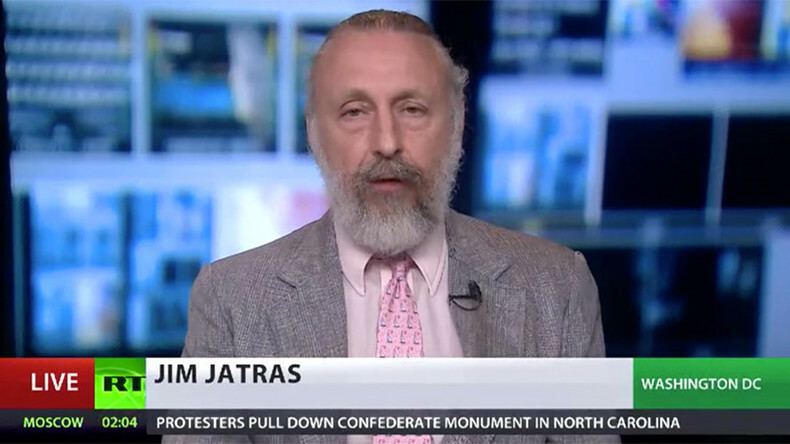 “I think they were just looking for any opportunity to fault him for saying what was obvious to anybody who watched that footage – which was there was violence coming from both sides,” Jim Jatras told RT. “Let’s be honest, for months in this country we’ve had this so-called Antifa, the so-called anti-fascist who frankly are fascists themselves, who use these Stormtrooper tactics to attack violently people they disagree with. They call them ‘racists’ even if they are not racists. You have people who can’t speak on college campuses – they’ll attack you if you wear a “Make America great again” hat and they’ve been doing it with impunity,” he added. According to the former diplomat, Trump was the right to call them out. “Of course he’s going to denounce, and rightly so, people who are in fact Nazis or Klansmen or things of their sort. But let’s not pretend that these people in black with the masks and the clubs are innocent,” he said. Trump has faced mounting pressure from lawmakers and the media to condemn the far right in stronger terms. However, the President said both sides of the conflict are to blame because “it has the virtue of being true,” Jatras said. 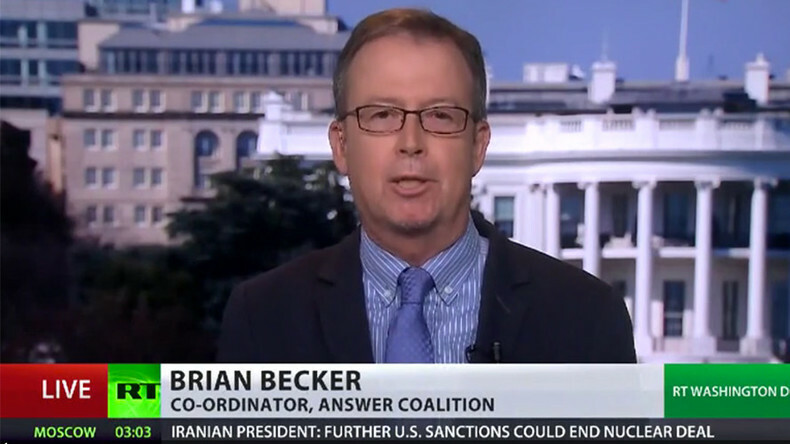 “Where is the Justice Department Task Force, the civil rights Task Force looking into Antifa, and where their funding is coming from, and who is directing their violent activities. That side of the ledger is not shown. Frankly, I think the Republicans are just as complicit in this as the Democrats,” he added. Following the Charlottesville clashes, some American cities rushed to remove Confederate-era monuments. According to Brian Becker, these statues commemorate people who took up arms against the US government in defense on slavery. “The Washington Monument, the [Thomas] Jefferson Memorial, which are also monuments of slaveholders – that is not the point – these monuments have been built not as a national historical thing – it is about the white supremacy movement erecting them at the times in American history in the 1890’s and in the early 1920’s and right before that, when there was an effort to push back against black freedom,” he said. John Griffing, investigative reporter: Clearly both sides [of the clash in Charlottesville] were spurring for a fight. These were two very highly charged energized groups of people, but one had a permit to be there, and the other group did not have a permit to be there. And the police stood by, stood down, if you will, and allowed this violence to take place, and did not intervene. That is their dereliction of duty. “But what we saw today was the real Donald Trump, and he is really angry at the left. The people who came out and provided protection and security from this organization,” said analyst. “They are America’s terrorists. 10,000 black people have been lynched in America – the KKK celebrated that. These people are not just another conservative right-wing group, and Trump actually stands with them, he is emotionally with them,” he added.